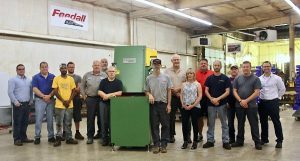 Feedall Automation is a family run manufacturing company headquartered in Willoughby, Ohio, announced today that it has shipped its 20,000th order since being founded in 1946. “It’s an exciting time to be a manufacturer in the US and to be involved with Feedall Automation”, says CEO Jon Cocco. While many companies are looking to outsource or offshore manufacturing, Jon believes that delivering the highest quality and best customer service starts with being able to control all aspects of the business including manufacturing. Feedall Automation handles all of the engineering and manufacturing inhouse at its 20,000 square foot facility. “We employ the best skill trades in the country that are able to machine, fabricate and assemble some of the most premium automation machines for the world’s best companies”, stated Jon Cocco. Feedall continues to grow this year increasing its labor force by 20%.